I'm out of the diaper stage of parenting, and have been for quite a few years. Even when I did use diapers, it was mainly cloth diapers. I do know, though, that many people who use disposable diapers end up with special diaper pails to help contain the stink. Here's more about Vliba, a stylish and cost effective diaper pail. Vliba sells a sleek and innovative diaper pail that provides new parents with a stylish and effective diaper disposal solution. The product was invented and first launched in South Korea and soon became a market leader because of its stylish design and effectiveness in odor neutralization. The Vliba diaper pail is available in six attractive colors that match décor in a nursery or any other room in the home. The diaper pails come in white, baby blue, baby pink, red, black and gray. They have many safety features and come complete with up to 6 months’ supply of lightly scented, robust diaper pail refill bags that accommodate 1,125 newborn diapers. Also included is a sample pack of Vliba's individual diaper disposal sacks that can be used for diaper changes in the car, at a restaurant, at grandparents’ house or anywhere else as needed. In addition to a sleek and modern design, the Vliba diaper pail has many features to help parents with a messy problem. Vliba has two seals with an inner and outer lid to control odors and discreetly conceal contents. The soft-close lid locks in an upright position when in use and gently and quietly closes when done. The large front access door makes the blade free changing of the custom fit disposal bag fast and easy. Vliba provides effective diaper disposal and odor control. No spill, no smell, no mess. Young parents appreciate cost effective solutions at what can be an expensive time. Many diaper pails require costly rings and tubes that can cost hundreds of dollars over a few short years. A one-year supply of durable, lightly scented Vliba refill bags is currently priced at under $ 20. 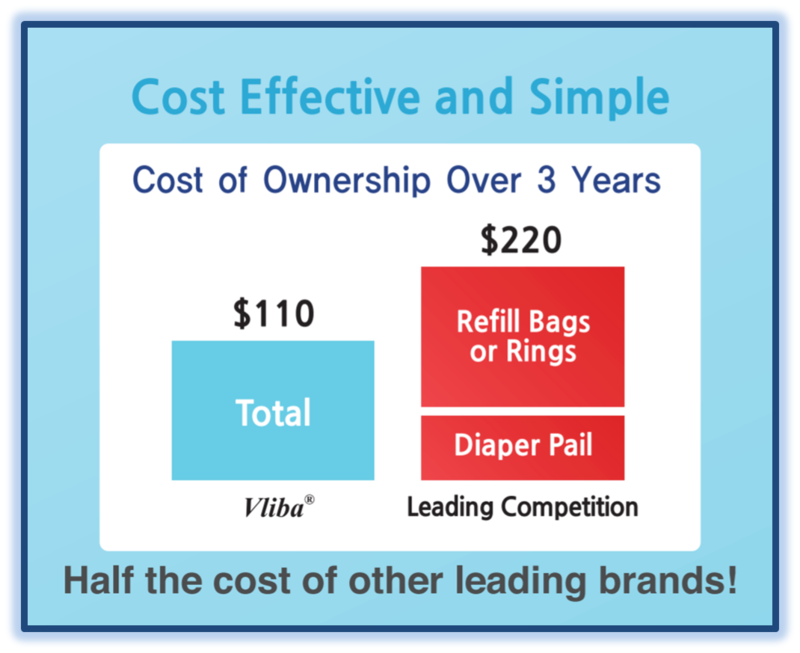 The Vliba diaper disposal system has a total cost of use which is half that of the leading competitors. Each durable bag has a capacity of 45 newborn diapers and accommodates diapers of all sizes, including cloth and adult products. Vliba single diaper disposal sacks are ideal for the nursery, stroller, diaper bag and car. They are available in a carton of 4 easy dispense packs containing 25 sacks each. These baby diaper sacks are the thickest (>1 mil of HDPE) and strongest that we have seen in the market They are perfect for use when away from home or for disposing of a particularly messy diaper before dropping it into the diaper pail. Vliba products are available on Amazon with Prime shipping included - https://www.amazon.com/dp/B079Y4V2XB. You can also find Vliba Products at www.vlibaworld.com and www.facebook.com/vlibaworld.